Abdullah would rise before Fajr (dawn) each morning and rush to the Mosque to offer the prayer. He would return to the Mosque for Maghrib (sunset) and 'Ishaa' (evening) prayers as well. He read the Quran daily. He studied other Islamic books in his spare time. He spent much of his free time with his family and took his role as the spiritual leader in his home quite seriously. Five years later, he found that he would go days, sometimes a whole week without performing a single prayer. He no longer attends congregational prayer at the Mosque—he didn't have time with his new job. This new job involved his working closely in nightclub establishments with people of questionable backgrounds. This resulted in his becoming very secretive about many of his work activities; he didn't even talk to his wife about them because he knew she would disapprove. Work kept him busy all night and throughout the entire weekend. Many of his new friends also worked with him and he began to spend a great deal of his free time with them. Because of this, he spent less time with his family. He had to sleep during the day in order to be able to work each night. His wife noticed a great change in his demeanor. They had several discussions about his work and how it was affecting him and his relationship with Allah Almighty. He agreed, and would begin the process of searching for new work, but inevitably, chose to stay in his current job. He soon found himself feeling very distanced from his wife and children. Even though the money was abundant when he first began, it was now barely paying the bills. He felt his marriage crumbling beneath the years of neglect. He found himself succumbing to depression over his circumstances, unmotivated to initiate the things he knew he would have to do in order for his life to change. It is interesting to note that 'Abdullah's life seemed much more peaceful and balanced when he engaged in his regular religious duties, and began to suffer significantly when he abandoned them. Could this simply be a coincidence? Imam Muhammad Baianouni the scholar from North Carolina in USA accurately sums up situations like this stating: "The regulation of a man's conduct within one system of life is one of the most important reasons of success and stability. The absence of this regulation is one of the greatest crises a man suffers from in his life. This happens when man is left without guidance from Allah, The Most High, or without proper upbringing based on the Divine Guidance. Under these circumstances, man's life becomes miserable on this earth and he will be amongst the losers in the Hereafter". The intensity of our faith changes throughout our lives. There are times when we are of strong faith, and times when we struggle. Many brothers and sisters who proudly claim Islam as their religion unintentionally find themselves "slipping" in their religious duties. Seemingly overnight their lives go from pleasurable and carefree to darkness and confusion. You may begin to acknowledge that you have landed in such a state because of the choices you made, but you are lost as to how to go about changing things. Being steadfast in our duties to Allah Almighty is what keeps you from languishing during your darker moments. Remember that your ultimate return is to Him Almighty, so you must develop discipline and a consistency in your daily routine to keep your faith from sinking. I have a good friend who was going through a very rough time. Her faith was at an all time low. During several of our conversations, she lamented that Allah Almighty was punishing her for not being a "good Muslim." I asked her: "Why must Allah be punishing you? Allah puts us through many tests and trials in this life to give us the chance to know Him better." We debated back and forth about this for some time. She was really stuck in the debts of despair, and found my comments annoyingly optimistic. I reminded her that Allah Almighty is also Merciful and that this trial for her could be the wake up call she needed to have an opportunity to renew and redeem her faith and become closer to Him Almighty. Perhaps Allah had to put her through such difficulty to get her attention and give her a chance to make changes. Evaluate yourself regularly to make certain you are doing all that you can spiritually. Perform your daily prayers punctually each day. Read the Quran regularly, with an effort to truly understand what you are reading. Seek knowledge regularly, religious and other, through books, CDs/tapes, classes and lectures. Keep company with righteous people. Have confidence in your faith and, more importantly, in Allah Almighty. Regularly spend some time alone in contemplation and worship. Islam is a complete way of life. 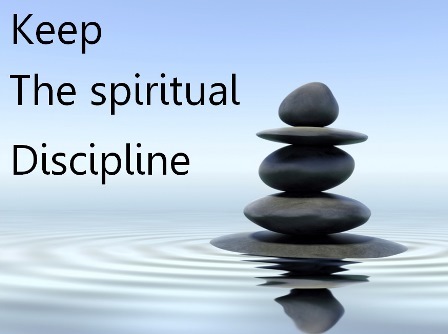 As believers, we should desire the discipline that allows us to regulate our lives and keep chaos away. In choosing this way of life, peace and contentment are your right. Discipline comes as a result of performing certain duties consistently. Ask Allah to help you to establish discipline in your religious commitment and to be able to submit to all that pleases Him Almighty.